Love. The starting point of nearly every musical. Finding a new way to play and sing about love is a challenge. How do you bring a new perspective to the theme? In Brendan Milburn and Valerie Vigoda’s Long Story Short, the journey of love, from first date to, spoiler alert, death do us part, is explored in a sugary-sweet two-hander. 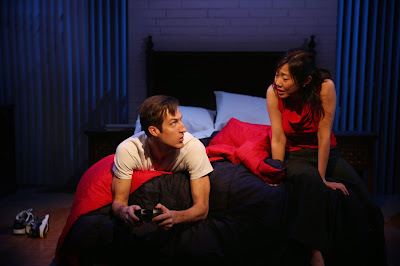 After an evening out welcoming LA newcomer Charles into town, Hope finds herself back at Charles’ tiny studio apartment and into his bed to take a nap after feeling ill. Charles promises to wake her up in an hour, but instead drifts off and dreams of a life, a future, a love, with his newfound friend. Long Story Short, based on the play An Infinite Ache by David Schulner, is a musical love story set in a dream. And what Milburn and Vigoda have created is nothing short of a dream. Long Story Short spans from the beginning of a relationship to the end of a marriage with every bump, heartache, and thrill along the way. What makes Long Story Short special is through a long journey, it’s believable. There are certainly hokey moments but they are made up for in sentimentality and tragedy. With Schulner’s play as inspiration, Milburn and Vigoda still put their own stamp on the tale of partnership and time. The theatrical pop score was fresh and lively, but sadly, there were no standouts that would be the show-defining. Regardless, the music was effortlessly brought to life by the lovely duo of Bryce Ryness and Pearl Sun. Ryness and Sun were up for the challenge of playing life-long friends, lovers, companions, and everything in between. Ryness’s goofy demeanor as Charles began as that loveable man-child but as Charles grew up before your eyes, so did Ryness. His transformation from lost in a world of fun to an adult with responsibility and morals was natural. Sun’s Hope started off as that typical woman in love but when her life took a turn for the worst, Sun gave a performance to remember. The moment of initial grief was heart wrenching. Watching her grieve alongside Charles yet find solitude was one of her finer moments on stage. Following a couple through their highs and lows sounds like a rough thing to watch but director Kent Nicholson made it anything but. Nicholson did exquisite work guiding Ryness and Sun through their emotional journeys. He found the moments to make both characters either the good guy or bad guy and yet still made you fall for them both. Nicholson’s staging was also quite keen to detail. Using David L. Arsenault’s wonderfully transformative set, Nicholson slyly allowed time to move and the pieces to fall perfectly back into place without notice. The simplicity of Arsenault’s set allowed Nicholson to use the entirety of the space. Long Story Short is a pretty romcom musical for the lover in all of us. It certainly has potential for staying power and life after production.